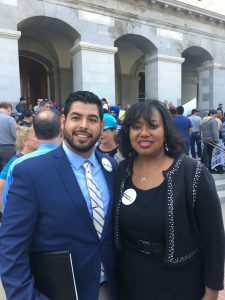 At the State Capitol rally of independent contractors on August 15 are Christopher Silva (left), Silva Sons Transport Inc., and Connie St. John, executive director, Neighborhood Music School. Hundreds of independent contractors gathered at the State Capitol yesterday to urge policymakers to suspend any application of a recent court ruling to allow time to decide the best test for determining whether a worker is an independent contractor. The workers at the rally included physicians, insurance agents, taxi drivers, rideshare drivers, salespeople, and speech therapists, among other independent contractors. In late April, the California Supreme Court issued a decision in Dynamex Operations West, Inc. v. Superior Court of Los Angeles, No. S222732 (April 30, 2018), in which it set forth a new standard for distinguishing between an employee versus an independent contractor. Speakers at the rally told moving stories about why they choose to be independent contractors and how that choice benefits them and their families. According to the U.S. Bureau of Labor Statistics, 79% of independent contractors prefer this model of work over traditional employment. California is estimated to have nearly 2 million residents who choose to work as in independent contractors. That figure is a conservative one as the 2018 U.S. Bureau of Labor Statistics Economic Release did not include the number of individuals who supplement their income with online platforms. This data is expected to be released by the department later this year. In addition, the franchise business model is based on an independent contractor relationship between a franchisor and franchisee. California has more than 76,000 franchise locations that support nearly 730,000 jobs. Without action this month, state legislators are putting the work of an estimated 2 million California independent contractors at risk. After the rally concluded, independent contractors met with their state legislators to asked them to suspend application of the ruling beyond Dynamex workers until the Legislature has time to develop a solution during the next legislative session. 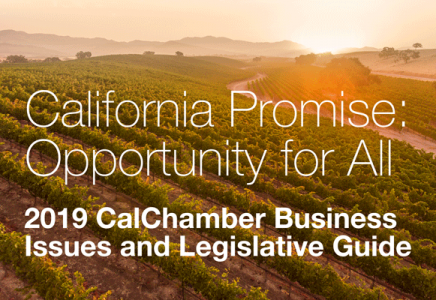 This CalChamber-led coalition is working to build support for workers’ ability to work independently. Through its website at imindependent.co, the coalition explains why state lawmakers need to suspend putting the Dynamex decision into effect (except for Dynamex workers) so that there can be a robust legislative discussion about how best to balance worker protections with a flexible work model.